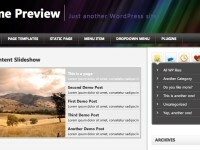 WP-Content Slideshow Plugin is a new, even much better Slideshow Plugin for WordPress. This Slideshow can show/feature up to 5 Posts/or Pages in a very clear way with a text and a featured image for every post/page. This Slideshow has a very nice pre-designed Layout. It shows all the titles and a little excerpt to the post/page on the right. On the left, the Slideshow features the image that was inserted in the post/page via post-thumbnail WordPress feature. Install the Plugin automatically via WordPress Plugin Installation Area or download the newest version of the Plugin right below, extract the files and upload them to your wp-content/plugins folder. Now save the post/page and have a look at your Slideshow! 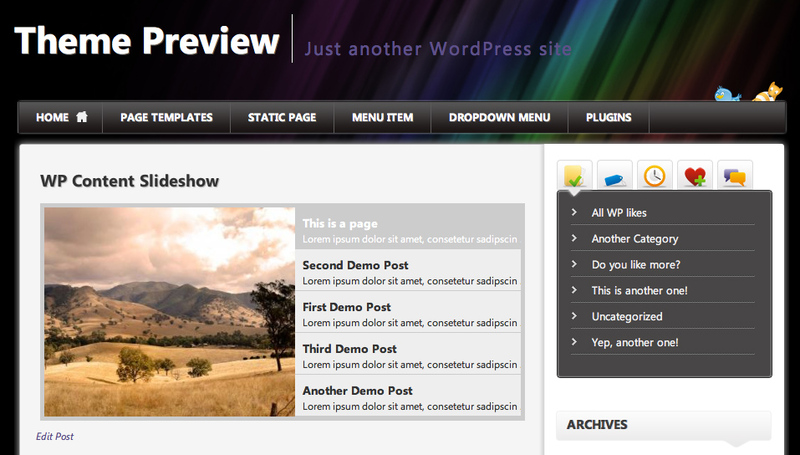 Thumbnails are being generated automatically via wordpress built-in functionality. There is no need to support timthumb anymore. If you are already using the plugin with images, you will need to regenerate thumbnails (regenerate thumbnails plugin). If you are customizing image-size you will need to regenerate as well! Dieses Plugin wird zusätzlich gesponsert von Brustvergrößerung Hannover. hi, I was using the previous version, but because was a conflict with the template / pagination problem, I updated the plugin , but now it’s not working – slider doesn’t do anything. Please help! I am trying to implement this plugin in my site. But it got an error. Is it because I use headwaytheme? still will not work. Will you mind providing my some advice? I installed the plugin; it works, but I can’t change the configuration. Any change I make doesn’t change the layout. (chmod of whole plugin-directory = 777). And how can I change the order of the 5 items? thank you for your review. I have no problems with this plugin – it works perfectly! New 2.1 update seems very good – thank you! Please note – „Set Image Height“ in the Configuration screen, does not keep/update data input. I noticed an error in the content-slideshow.pfp css in the 2.1 version, the height and width of the ul and li are hardcoded and don’t respond to custom image sizes. Setting these values the same as the img fixed the problem. Really awesome plugin you created here. @Micheal: That was just was I was looking for. the effect from fade to scroll ? Have a look at the style that is included with the slider. you may set your values (image width/height) manually. Is there anyway to change the order of the featured items? I have changed the end of my excerpt from „…“ to „learn more…“ and would like that to also link to the post, is it possible? When you mouse-over the text it shows the image associated with that text and then when you click on the text you are brought to that page/post. Is this possible, any direction would be much appreciated. I’ve implemented the plugin and got the sizing sorted out. It looks good, but one thing: I am using this to feature pages, rather than posts at the moment, but when I add content to the „excerpt“ field, it puts the excerpt on a second line, and breaks the links. I’d really appreciate your input on this! Sorry, to add to the above post: It appears excerpts are going on a second line for Posts as well. Hi, Thanks for the great plugin! What is its license? We want to adpat it and also make it part of a theme we are working on, but we don’t know if the license terms of your plugin will allow us to do it. Congratulations for your impressive scripts and for sharing them with us!!! Really thank you. I installed your great „WP-Content Slideshow Plugin“ with another image slider i found around but as i see the jQuery of these two scripts conflict, and WP content slideshow stops. I searched in the internet and i read that i must use jQuery.noConflict() command, but i have no idea how to do it and where to do it. I would really appreciate if you could help me with this problem. Your script is really excellent and i want to use it!!! Ich baue im Moment die Seite für unsere Nepalhilfe um. Ich habe in WP Content Slideshow Configurations – Bildgröße geändert – wird auch vergrößert aber wegen Eintrag in der CSS (300px – 250 px) wird nur ein Ausschnitt angezeigt. Hello! Fantastig plugin, is exactly what i was looking for! but one problem i have found.. it displays only the iamge, no title or text… any solution? Hi, i just use your plugin and successfully integrate it with my site. but, there is minor problem, that in navigation menu, my permalink cannot load. so, slideshow navigation cannot be clicked. so, how i’m suppose to do to fix it?